Although chromosomal rearrangements such as inversions are common in many taxa, little is known about how they evolve. 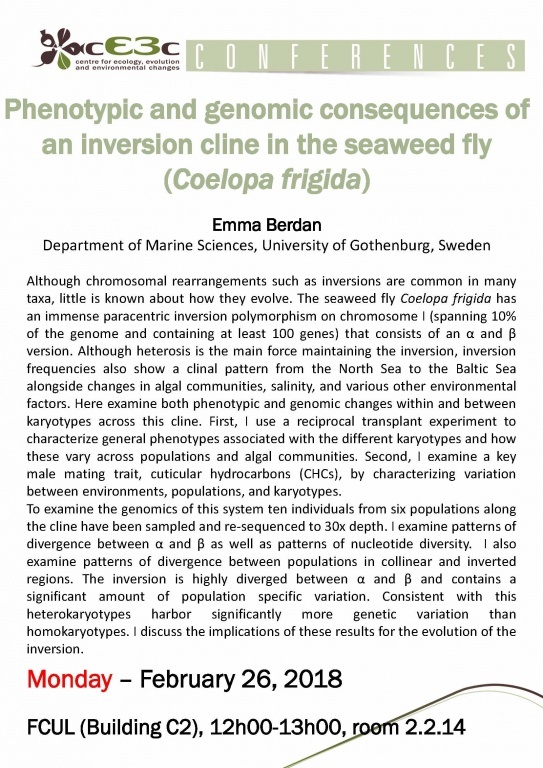 The seaweed fly Coelopa frigida has an immense paracentric inversion polymorphism on chromosome I (spanning 10% of the genome and containing at least 100 genes) that consists of an α and β version. Although heterosis is the main force maintaining the inversion, inversion frequencies also show a clinal pattern from the North Sea to the Baltic Sea alongside changes in algal communities, salinity, and various other environmental factors. Here examine both phenotypic and genomic changes within and between karyotypes across this cline. First, I use a reciprocal transplant experiment to characterize general phenotypes associated with the different karyotypes and how these vary across populations and algal communities. Second, I examine a key male mating trait, cuticular hydrocarbons (CHCs), by characterizing variation between environments, populations, and karyotypes. To examine the genomics of this system ten individuals from six populations along the cline have been sampled and re-sequenced to 30x depth. I examine patterns of divergence between α and β as well as patterns of nucleotide diversity. I also examine patterns of divergence between populations in collinear and inverted regions. The inversion is highly diverged between α and β and contains a significant amount of population specific variation. Consistent with this heterokaryotypes harbor significantly more genetic variation than homokaryotypes. I discuss the implications of these results for the evolution of the inversion.